Meet Patrick Foote host of YouTube’s “Name Explain.”: the upstart YouTube channel explaining name origins of notable places/people/subjects. This past March, TGNR’s Managing Editor Paul K. DiCostanzo interviewed creator and host of the channel Name Explain, YouTube’s Patrick Foote. 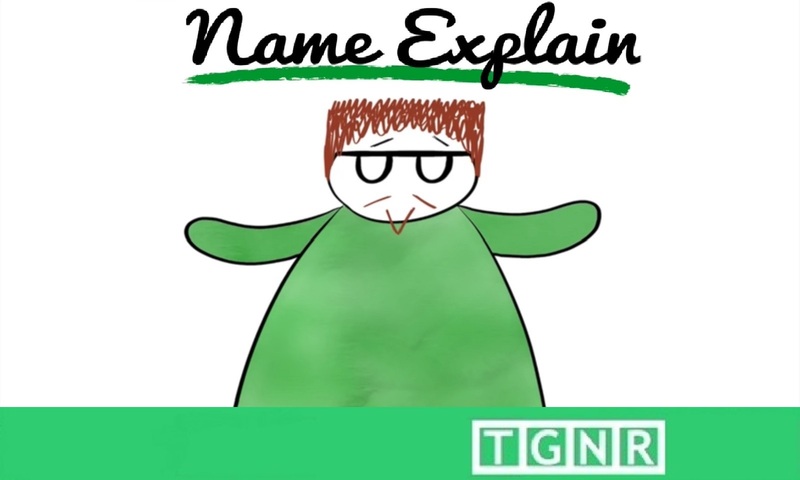 Name Explain is a channel dedicated to unraveling the etymological and linguistic origins of many notable places, people or subjects that define the world. Through his channel Mr. Foote has popularized linguistics and etymology – traditionally viewed as dry and pedantic subjects by many – to a large and constantly growing audience. How does he keep viewers clicking “subscribe?” Simple: Name Explain makes these subjects accessible in a way few others have seldom accomplished. Patrick chatted with Paul about the origins of Name Explain, his background, and the challenges of building a new channel from its very foundations. What is in a name? That is a rhetorical question that has been posed throughout the history of the English speaking peoples – perhaps most notably in Shakespeare. Patrick Foote, creator and host of YouTube’s Name Explain, is answering that very question. Human beings think and understand the world in language. However, the significance behind the words and names human use to comprehend this world are often far more interesting than the average word monkey gives credit. Cue Patrick Foote, as this is precisely where Name Explain takes center stage. Patrick Foote’s passion for linguistics and etymology is a more recent discovery. The 23 year-old from southwest England first encountered this fascination when choosing an additional subject for his UK A-Level exams. The choice was a serendipitous personal revelation that revolutionized his entire life. After briefly attending university for linguistics, Foote found the experience unfulfilling and moved on. What might have appeared like an ending at the time was actually a beginning. The video was precipitated by a family trip to the continent. While riding in the car, Patrick saw a sign for the Dutch province of Zeeland. That moment became a catalyst for Foote, an experience that yielded a chain reaction, which ultimately lead to his 2+ year YouTube project. In speaking with TGNR‘s Paul K. DiCostanzo, Patrick Foote emphasized that he is not a professional linguist. However, with the modern democratization of media, Foote is reaching a considerable audience on a subject few others in history have been able to popularize. Like most successful YouTube creators, Patrick offers answers to unique questions; specifically he answers questions people didn’t realize they wanted answered. That being said, Name Explain is tackling this erstwhile dry subject in a singular style. In the YouTube universe, the genre of “edutainment” is experiencing exponential growth. There is considerable demand not only for new, high quality original content but there is also a blended insatiable desire for knowledge in a very digestible form. Channels such as The Great War, or AlternateHistoryHub are prime examples of those who have pioneered this approach on YouTube. When it comes to the vast sphere of linguistics and etymology, Patrick Foote is among those pioneers staking claim. In doing so, Foote is highly insightful in how he has made it so. It is no secret that creating original content for mass consumption is a complex process. Both in effort and the emotionally complex quagmire of putting oneself out there – it can be daunting. When asked what his mindset is when creating ones own content, Patrick Foote operates by the maxim that, “If one person likes something, a million can also like it. If one person finds something funny, there is a continent of others who will also laugh.” A simple and direct approach that is far from simplistic. Yet in a modern context, one requires more than excellent content and a fan base to continue making new content. Like many fellow YouTube creators, Name Explain supplements its channel revenue through the crowd funding platform Patreon. Patreon operates on the basis of monthly donations from a creators fan base. With numerous possible monetary denomination options for supporters, creators reciprocate to their benefactors based on the amount they give. For example, Name Explain patrons that donate $5 a month, Patrick creates a unique drawing in the channels animated motif specifically of that patron. For $10, he will send a Name Explain postcard to any address in the world. Within this arrangement, Patreon serves both the aim of generating revenue to support ongoing work, as well as being a medium that builds community between creators and fans. The interactions between creators and their contributors over time has constructed an intimate sinew that not only generates revenue, but also builds an unprecedented bridge between creators and fans in highly celebrated fashion. Patrick Foote is one of many who through their initial creative efforts has found his vocational calling. Such an opportunity is a very unique opportunity created by modern mass media, and is a new hallmark of possibility previously unknown. It is a tremendous journey into the unknown like any other major change in profession. Name Explain has anted up and is going all in. When it comes to answering questions people didn’t realize they wanted the answer to, Foote is demonstrating undeniable skill. When it comes to answering the most important question all creators ask, “What if I do something different?” Foote’s response is clear. It is a question all of his 100,000+ subscribers are very pleased how Patrick Foote has answered. Enjoy the video below “Why Do Austria & Australia Have Such Similar Names?” and checkout Name Explain for yourself!